We are looking forward to a great 2018-19 school year and are glad you have joined CSF-CJSF in “Scholars for Service”. Chapters must renew and pay dues each year. Dues are payable now and due no later than January 31st of each year. 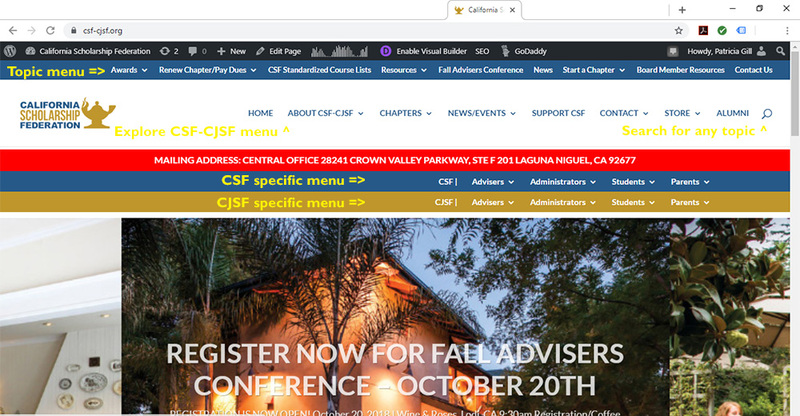 CSF Course lists are due no later than October 1st each year. Get more information and submit Standardized Course Lists here. Panda Express and CSF/CJSF will partner for two fundraisers this school year. Funds raised will benefit the CSF/CJSF state organization. There will be lots of opportunity for participating CSF/CJSF chapters of all sizes to have fun and win prizes for their chapters. Mark your calendar for November 8, 2018 and Stay Informed through email, this website, and social media. Familiarize yourself with our website! There are a variety of menus to guide you to the information you seek, and a Search icon (magnifying glass) to simply type in the topic you need and quickly get a list of pages and posts addressing that topic. Have a great year and Stay Informed!